Tried something a little different and came up with a piece outside of the norm of my style. Turned out pretty awesome and the response has been great! Prints are available for purchase by clicking the picture below. This entry was posted in Fine Art and tagged art, fishing, flats, florida, fly fishing, laferriere, Louisiana, nick, painting, redfish, salt life, saltwater, skinny water culture, tailing on January 31, 2014 by nicklaferriere. Black Marlin are known as one of the largest of the marlin family, with fish report at over 1,700lbs and over 15ft in length! These predators of the East/Indo-Pacific feed on smaller tuna, cuttlefish, and well, any smaller fish in its path. These behemoths have been reported reaching speeds of 80mph (130km/h), making them one of the fastest fish in the ocean. 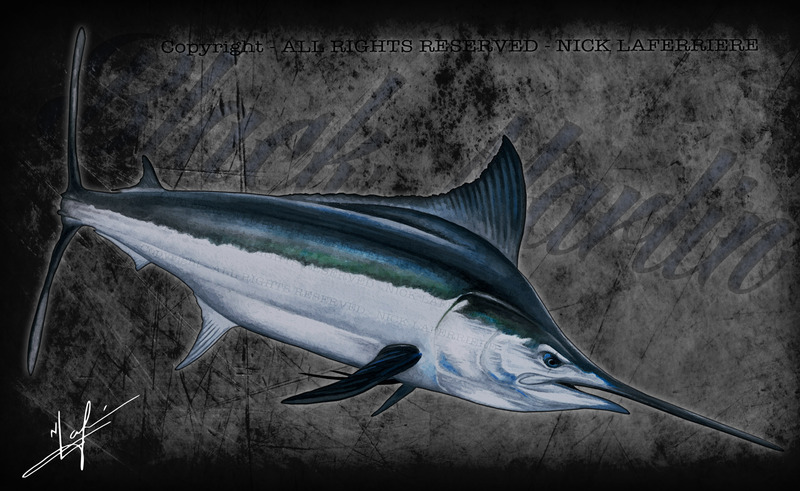 This entry was posted in Uncategorized and tagged billfish, black, drawing, fishing, gamefish, laferriere, marlin, nick, painting, saltwater on September 19, 2013 by nicklaferriere.